First thing to say is that I'm a bit of a Johnny-come-lately as far as the TVPs are concerned. It's only been in the last 12 months that I've had any interest in them. Second thing is that my expectations were low having heard the 100 club gig was somewhat patchy. Despite this I had a great time. A small friendly crowd were very up for it. For the first 30-40 minutes the band were pretty together and every song was a winner. Then Dan started having problems with his guitar. New guitars appeared from time to time but there was something wrong with each one. Meanwhile it started to become apparent that Dan was getting increasingly annoyed and disturbed by some of the banter. Some sections of the crowd seemed to enjoy winding him up - something akin to shooting fish in a barrel - but that's what some pissed people do. From this point on the gig started to degenerate. They still managed a few good tunes. Crowd favourite 'Salvador Dali' being one of the better ones, and a new song called, I think, 'She Stops Traffic'. Eventually the gig just ground to a halt. Ed Ball wandered off with the drummer. Dan started hammering the keyboards for about 10 minutes whilst, I think, singing songs too. All very weird but strangely compelling. The whole gig took place with a Terence Stamp film from the sixties (that I didn't recognise) playing behind them. Anyway, despite the lack of a big finish and encore - not what I expected anyway - the whole thing was pretty damn fine and I've had no hesitation in going to see them again. Hopefully with each live gig Dan will get more resilient and confident. Despite having no great history with the band it's great to see them back. Sham 69 were the punk band I saw more than any other in the heady days of 77-78. I was just too young to see the Pistols in 76, and it was early 77 before I started going to gigs. 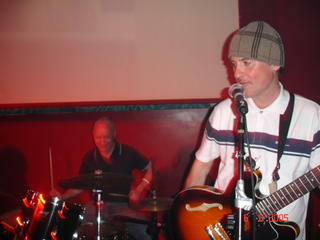 The first time I saw Sham 69 was at the 100 club. There were 10 people in the audience: my two mates, 7 skinheads and me. Earlier that day Sham 69 had signed to Mark P's Step Forward label. The skinheads were heckling Jimmy Pursey for having "sold out". Step Forward released the excellent I Don't Wanna / Red London / Ulster Boy EP (produced by John Cale). My last Sham gig was at the Roundhouse in Autumn 77. At least half the crowd were skinheads, many more marauding around outside without tickets. One gang reversed a truck into one of the fire exits to try and break in. That gig was very violent and put me off ever seeing Sham play live again. Coincidentally the gig was filmed for the Old Grey Whistle Test, the clip they showed included Jimmy handing a young punk at the front the remains of his lager - I was that young punk. Anyone lucky enough to experience first hand the excitement of punk rock in Britain in ’77 would agree that Sham were one of the best. These days people seem to remember them for their slightly cartoony hits – Hersham Boys, Angels With Dirty Faces, The Kids Are United and Hurry Up Harry. But the early songs – stuff like Borstal Breakout, Ulster Boy, Rip Off, What Have We Got, Tell Us the Truth, Questions and Answers – were prime slices of early UK punk. Jimmy Pursey was always an engaging and passionate front man too. So how would it be seeing them for the first time in 27 years? I arrived in time to catch the last 7 or 8 songs of the UK Subs set. I’d already moved on from punk by the time the UK Subs were gaining popularity. From my disinterested position Charlie Harper always seemed something of a joke figure – a middle-aged hairdresser turned punk. That said I quite enjoyed the songs I heard. These days Charlie is a portly fellow and was giving it his all. Unfortunately his passion and lack of fitness resulted in him having to wipe the sweat out of his eyes every few seconds. Hard to maintain ill defined rage when you have to keep wiping your eyes. There was a sizeable Subs crowd if the t-shirts were anything to go by and they all seemed pretty happy. And, if punk-by-numbers enthusiastically played by punk survivors is your thing, then you’d be happy too. They were certainly very watchable but nothing special. The crowd were a weird mix. A few ageing skinheads looking quite flabby and unthreatening (weird how the prevalence of Beckham-inspired crops has taken the edge out of the look), some ageing punks still living the dream (fat, middle aged and sporting a mohican is perhaps not the greatest look in the world), a few young Euro-punks checking out some punk legends, a lot of 30 or 40 somethings in varying degrees of decay, and a few biker / rocker types all of whom seemed to be wearing Motorhead t-shirts. Everyone was very good-natured and there was a party feel to the event. Jimmy, Dave Parsons and the rest of the band shuffled on to the stage whilst most of the audience were at the bar. Jimmy smoking a fag and smirking. The years have been very kind to Jimmy. He looks better than ever - hair longer and more tousled than in his heyday, very trim, fit looking and energetic – and with loads more charisma than poor old Charlie Harper. He really is a consummate performer, moving between Lydon’s psycho stare and mike stand hanging to a Frankie Howerd smirk and Kenneth Williams campiness. The best thing about it all is that Jimmy patently realises the absurdity of this – but he loves it and so do we. Everyone’s in on the joke. All of which makes for wonderful entertainment. The hits were peppered throughout the set, a lot of the early stuff was present and correct, a couple of new songs (including the obligatory “Iraq war” inspired number), and some other stuff I assume was ‘mid-period’. All sounded great. I was never less than captivated and happily joined the moshing for Borstal Breakout, Ulster Boy and Angels With Dirty Faces. My expectations for this gig were low but it really was great entertainment. Watching Sham also made me realise just what powerful music punk is, and how uncontrived – a far cry from today’s scene. As I cycled home along Brighton seafront caught up in memories of punk rock and the late seventies it really struck me just HOW different things are today. The seafront was heaving with Saturday night revellers all smartly dressed in their cheap, disposable, sweatshop-manufactured finery. It appeared I was amidst an almost universal level of conformity and homogeneity. Everybody’s happy nowadays. I continued along the front and there was an open air screening of Quadrophenia on the beach. Having travelled from the noughties to the seventies and back again, I was now transported to a fictionalised version of the sixties. Again I was struck by the changes. The Mods and Rockers also seemed a far cry from the more predictable world of today. Maybe it’s a good thing? Maybe every generation thinks the era of their youth was the best? Either way I’m grateful I had punk rock and I’m glad that Jimmy Pursey is still out there doing it. Some people are dismissive of rock musicians continuing to play nostalgia-type shows. It’s OK for old bluesmen or jazz musicians to be doing it into their old age but wrong for rock musicians. I probably thought so too once upon a time – not any more. “If the kids are united they will never be divided” . Try telling that to the kids of today - they’ll laugh in your face. After the musings about the death of rock ‘n’ roll, and the deciding that I'm just an old git, I posed myself the question: 'What makes life living?' Worth living from a strictly musical perspective that is. My answer is very much a snapshot of what is getting me juiced up right here right now …. David Holmes and his wonderful compilations; Primal Scream and their refusal to stop trying to reinvigorate the twitching corpse of rock ‘n’ roll; budget price Beach Boys reissues; ‘Smile’ finally being released; Masters At Work (esp. the 10th anniversary box sets) – today’s Gamble and Huff; the plethora of excellent Northern Soul compilations; Super Furry Animals; Domino Records; Mojo’s Garage compilation and the 2 Nuggets CD box sets; Fela on CD; the Funk Brothers & ‘Standing in the shadows of Motown’; the Rough Guide series; Four Tet; Beta Band; the return of the Pixies; the White Stripes; ‘Satellite of Love’ remixed and on the airwaves again; Goldfrapp; the Flaming Lips; Orchestra Baobab; Boards of Canada; belatedly discovering US punk; Spark’s ‘Lil Beethoven’ (I think neo-masterpiece sums up this jaw dropping release); the Sparks 70s output; Beastie Boys ‘To the 5 Boroughs’; the return of Dexys; Essential Asian Flavas comps; DJ Yodda mixes; the return of Morrissey; Soul Jazz records (esp the reggae, dub, studio one and punk funk comps); Arthur Russell compiled; Wire still doing it; the Fall – fit and working again; Country Got Soul comps; Beyond Nashville comps; Tom ‘The Jedi’ Middleton’s ‘the Trip’ comp; BBC 4 music docs (‘Wrong Eyed Jesus’ – another good ‘un); Trojan reissues; Don Letts’s comps; Subway Sect ‘Sandsend’; and above all, the plethora of stuff I’ve yet to discover! Hell, that little lot going on who’s got time to be depressed about the death of rock ‘n’ roll? What about your reasons to be cheerful? What’s making your musical life a thing of wonder and beauty? Has there ever been a time as bad as this for new rock music? Rock 'n' roll seems to be on life support. Yes, I know I could be listening to wonderful sounds from around the world, and sometimes I do, but this post is about good old rock 'n' roll. The Glastonbury highlights brought this home to me. Bloody Keane, Jet, Starsailor etc. I can't think of a decent new band. Some of them are OK (Franz Ferdinand, Libertines, Ordinary Boys), but not truly great, but most are dull, dull, dull. I was making this point to some friends on Saturday in the Juggler (listening to the OKish retro dj - bit too mainstream for my tastes). I was conscious that it makes me sound like an old git. Hell I am an old git. But I'm an old git who has always been very passionate about music and I cannot remember being less enthused about new bands than I am now.We were also discussing eighties music on Saturday. The general perception seems to be that the eighties was a bad time for music. Now, looking back it seems like a golden age. Really, there were so many great, diverse bands - AND we still had real pop stars and real pop music - life was good. Where are today's Smiths, Bunnymen, Madness, New Order, Bauhaus, Wonderstuff, Def Jam stuff, Reggae + Dancehall + Ragga, New Romantics, Public Enemy etc. etc.? (I know this isn't exclusively a rock 'n' roll list but I'm trying to convey the diversity that was prevalent in those supposedly dire times). Part of the problem seems to be the lack of originality and ideas. In 1976/77 bands that took their inspiration from the Pistols generally didn't try to slavishly copy their sound. Many bands had their own unique sound. These days, for example, Travis have a modicum of success, before you know it we've got Coldplay and Keane who to my ears sounds very similar. AmI wrong? If so, why? And what should I be getting excited about? What was the last new band or artist that got you really juiced up?